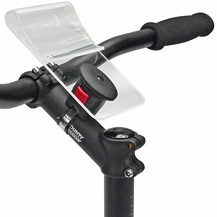 Product information "Rixen & Kaul KLICKfix Mini Map I card holder"
Handy map-holder competely made of plexiglass, easily mounted onto handlebar or stem using the KLICKfix Mini-adapter. All map sizes simply slide in. With quick release system, easy to remove by pressing the red button. Can also be used in combination with handlebar bags. Two sizes available. Related links to "Rixen & Kaul KLICKfix Mini Map I card holder"
Customer evaluation for "Rixen & Kaul KLICKfix Mini Map I card holder"